The King Mango Strut is a satirical and light-hearted parody parade of major events throughout the year. Founded by Glenn Terry and Bill Dobson in 1982, it is held on the last Sunday of each year; this was its 34th annual hosting. 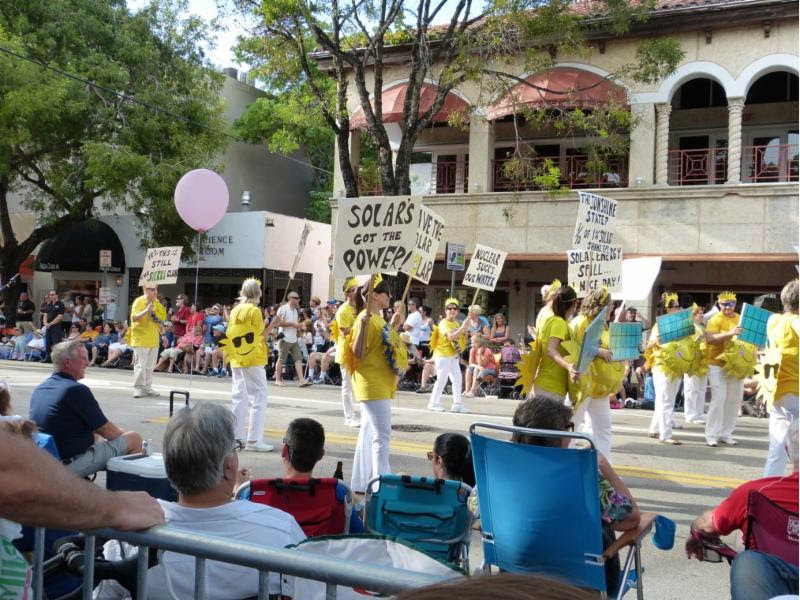 The Miami Group has participated in the King Mango Strut for many years. Topics covered have ranged all the way from widespread sea level rise, to the RAM development project and endangered butterflies. This year, with Coky Michel as director and the inventive and talented skills of Amy Werba, Don, and other volunteers came up with a creative skit which illustrated the sun-stroked "FPL" Vampires vs. Solar Panel-Armed Suns. Our performance made the only large photo in the Miami Herald print edition this year. The skit included vampires holding signs such as "your aquifer water is our life-blood", "solar is for sissies", and "solar power makes me cower", representing the battle that Floridians have been facing against FPL's anti-solar monopoly, the problem of freshwater evaporation from Turkey Point's cooling canals, and how only 1/10th of 1% of FPL energy comes from solar. The Suns, on the other hand, carried signs such as "a solar spill is called a nice day" and "solar's got the power" representing the lower volatility and potential solar energy has. The skit was repeated every 40 feet or so along the route so that all paradegoers experienced the full message. We sang "Here comes the sun, FPL!" to the tune of the Beatles' "Here comes the sun". Between the suns and the vampires were two suns carrying a casket with the words "Sunstroked Vampire" on each side, and a large sunbeam jutting out of the coffin lid. The main vampire would run and try to rescue his friend by removing the sunbeam, only to have suns carrying solar panels attack and defeat him and the rest of the vampires. In this year's King Mango Strut there were a number of groups making fun of well-known recent events. These ranged from the heart-wrenching Ms. Universe mixup to Sea Level Rise, and even included a specimen of Trump's brain. The parade was accompanied by live music, and had a fantastic turnout, which overflowed the sidewalks of downtown Coconut Grove. Plastic Bags bill in Committee - Calls Needed!